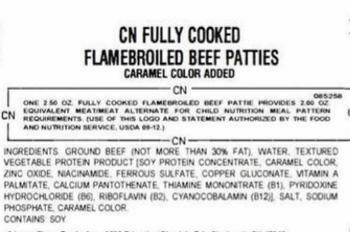 AdvancePierre Foods of Enid, Okla., is recalling approximately 20,373 pounds of ready-to-eat beef patties. The product may be contaminated with extraneous materials -- specifically soft purple plastic. The recalled product, bearing establishment number “EST. 2260E” inside the USDA mark of inspection, was shipped to food service locations nationwide. While the product was distributed to schools, it resulted from a commercial sale and was not part of food provided by the USDA for the National School Lunch Program. Food service locations that purchased the recalled product should not serve or consume it, but discard or return it to the place of purchase. Consumers with questions about the recall may contact AdvancePierre’s consumer affairs hotline at (855) 382-3101.